Topology built based on the analysis of Frank-Hoeflich et al. (2007) that combines molecular, osteological, morphological, and behavioral characters. Pereria and Baker (2004) present a similar topology, varying only with a sister relationship between M. tomentosa and M. mitu. Both studies suggest the non-monophyletic nature of the genus, with Pauxi unicornis embedded in the Mitu clade as sister species to M. tuberosa, suggesting the possible need to re-evaluate grouping at the genus level. Frank-Hoeflich, K., L. F. Silveira, J. Estudillo-Lopez, A. M. Garcia-Koch, L. Ongay-Larios, and D. Pinero. 2007. Increased taxon and character sampling reveals novel intergeneric relationships in the Cracidae (Aves: Galliformes). Journal of Zoological Systematics and Evolutionary Research 45(3): 242-254. Grau, E.T. , S.L. Pereira, L.F. Silveira and A. Wajntal. 2003. 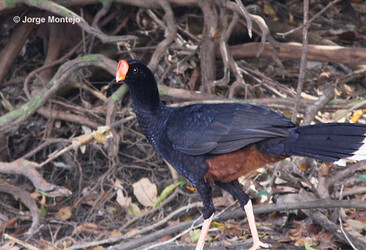 Molecular markers contribute in the management of a breeding program of the extinct in the wild Alagoas Curassow Mitu mitu and confirm the validity of the species. Bird Conserv. Int. 13:115–126. Pereira, S. L., and A. J. Baker. 2004. Vicariant speciation of Curassows (Aves: Cracidae): A hypothesis based on mitochondrial DNA phylogeny. The Auk 121(3): 682-694. Page: Tree of Life Mitu. Authored by Julia Gulka and David P. Mindell. The TEXT of this page is licensed under the Creative Commons Attribution-NonCommercial License - Version 3.0. Note that images and other media featured on this page are each governed by their own license, and they may or may not be available for reuse. Click on an image or a media link to access the media data window, which provides the relevant licensing information. For the general terms and conditions of ToL material reuse and redistribution, please see the Tree of Life Copyright Policies.